Using nimbl has never been easier! When your nimbl card arrives in the post, undoubtedly you will be excited to try out your new method of responsible spending! But how do you find out your PIN number? 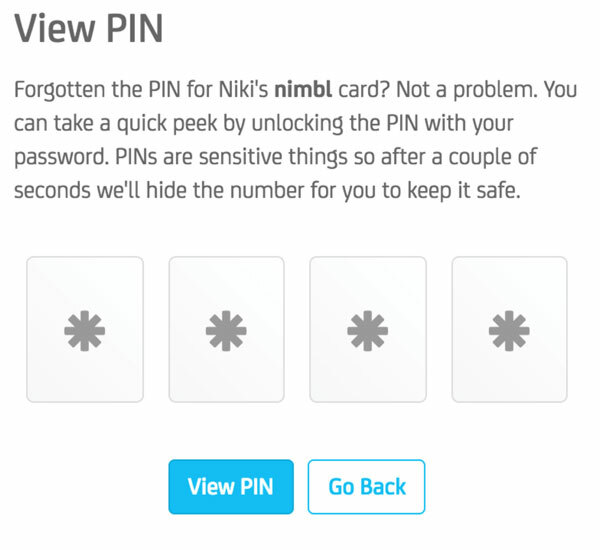 One of the great features of the nimbl card is that the PIN DOES NOT come in the post, instead through our website or mobile app, you can ask your parent or guardian to view your PIN as soon as they have activated the card. Once your card is activated, the PIN will be revealed! Yes – it really is that simple! You can also ask your parent to login at any time for a PIN recap (just in case you forget). Go to the child’s nimbl card page. Click on ‘View PIN’ and enter the Parent Account password for verification to see the PIN. The PIN will be revealed for 5 seconds, so make sure you are ready to take note of it.